A Ricci triple decker arrives from Decca Eloquence, the Australian arm of the company with a wide-ranging and frequently unerring eye for important discographic statements. Here for instance we have six discs in total, part of the outstanding legacy committed to disc by the indefatigable and seemingly indestructible Ruggiero Ricci. The first twofer is devoted to Romantic Concertos and leads with the Beethoven in the 1952 traversal with Boult. This is not a work one associates with Ricci and the only other surviving example known to me is an obscure Bulgarian State performance on One-Eleven URS 91050. Boult was always a good accompanist and he is on incursive, strongly etched and accenting form. With a less spiky player, such as Oistrakh, he was more resplendent, but here he responds to Ricci with appropriate masculinity and drama. Crisp tuttis abound. 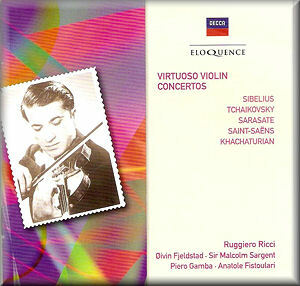 Ricci plays with vitality and in the slow movement with silver nitrate tone and a quick vibrato. Hardly seraphic in orientation, it’s nevertheless a galvanic sort of performance. And though the orchestral strings now sound somewhat bleached one warms to the disciplined sincerity of the collective responses. The Mendelssohn is with the Netherlands Radio Philharmonic Orchestra and Jean Fournet in 1974 – this isn’t the earlier LSO/Gamba, though their association is marked elsewhere. Ricci seldom conquers by stealth, and that’s true of this performance. Instead his communicative sinews are fully stretched, remaining muscular in orientation and in projection. He would hardly espouse the raffiné in this or any repertoire but he does capture plenty of the fun and caprice of the writing. Incidentally he’s quoted briefly in the notes saying that during the rehearsal a member of the orchestra (‘an idiot’) remarked on his fast tempo for the first movement and so Ricci modified it for the recording. Amazing that he should feel so inclined! The Bruch sees the teaming of the two youthful figures of Ricci and Gamba. This 1957 meeting witnesses a commanding display from Ricci, his sound quite astringent, when one considers the somewhat gestural warmth so many players bring to it. One or two expressive finger position changes stand out in the slow movement, whilst the finale is buoyant and replete with resinous down bows. This may not be the ideal or expected sound world for this concerto but the playing is certainly fascinating. The final concerto in this first twofer is that of Dvorák with Malcolm Sargent. His St Louis recording with Walter Susskind is probably the better known of the two and supplanted this earlier take on it. In my review of the other performance I spoke of the violinist’s ‘febrile, coiled and intense’ tone and his occasionally sentimentalised way with the concerto, qualities that do exist to a significant degree in this earlier performance. But the sound is vivid with a bit of an echo to boot and it captures a good degree of detail for the time. There is virtuosity and panache aplenty but it’s not as rhythmically convincing or as lyrically opportune as it could be. Sargent is an impressive collaborator, giving the basses their head in the slow movement and the wind theirs in the finale. The second set moves from the Romantic to the Virtuoso. As one can tell these titles are merely hangers on which to hang the performances and not necessarily to be taken too literally. The Sibelius starts things off, the 1958 recording with the LSO and Øivin Fjeldstad. I know there are at least two other examples of Ricci’s way with the concerto – on Turnabout with the Bochum Symphony and Kuntzsch, and the other a live Helsinki performance under Mikael. But realistically this early recording on Decca is the one to have. There’s noticeable tape hiss here, rather more so than in some of the companion works. Don’t expect a wizened, white toned opening, mysterious and aloof. This is Ricci, big of vibrato, meaty of response, ballsy and masculine. The performance naturally falls onto the side of chewy intensity rather than anything more variegated emotionally speaking but its rugged intensity is undeniable. There is an equally big response from the brass, which really lets rip when called for, once or twice rather startlingly. Of the 1961 Tchaikovsky it’s probably appropriate to say relatively little. This was a remake of the earlier recording he’d made in London, again with Sargent and it shares the extrovert and virtuosic qualities of the predecessor. The tuttis are powerful and marshalled with exemplary panache by Sargent. Ricci’s vibrato-conscious playing, not always attuned to the romantic repertory in other contexts, here finds a hugely suitable vehicle. His changes of tone colour in the central movement attest to his thinking musicianship and the finale displays his vibrant but unflorid control. The Sérénade mélancolique and Souvenir d’un lieu cher round out a powerfully persuasive disc. These qualities continue in the companion disc which gives us the expected brace of Sarasate and Saint-Saëns flag wavers, all four of which are dispatched with rapier like legerdemain by the fabulous Ricci. The balance of interest then falls on the Khachaturian Concerto, in which Ricci remembers that the conductor, Fistoulari, insisted on beating three, not one, in the finale, thus slowing things up, to the violinist’s intense indignation. The recording was one of those Decca winners with a great deal of space and detail audible; note the lower brass and percussion in particular. Ricci is on strong, songful form. It’s not the most evocative playing ever, but it is lyrically intense. The slow movement too is touchingly done, ripely as well when necessary, but it’s not really much of a match for the earlier Oistrakh recording with the composer on the rostrum. The last set focuses on something of a Ricci speciality, solo sonatas, with the pleasurable addition of a collaboration with Carlo Bussotti in Prokofiev. He recorded the complete sonatas and partitas of Bach twice over, and some individual works and individual movements exist from the days of 78 onwards. These two Decca performances of the first two sonatas preserve his curvaceously phrased and richly toned approach, one that however remains over-vibrated especially in the lower two strings. One can cite the Siciliana of the former and the powerfully intense Allemande of the latter. Some of the bowing in the Chaconne is truly Napoleonic. The Bartók sonata offers some splendid examples of his resinous and theatrical sense of projection. Volatile and virtuosic it offers a combative alternative to the visions of Menuhin and it remains superior to the less sweeping panache of Rostal. There is a moving simplicity and directness to his playing of Stravinsky’s Élégie, a performance that launches the second disc. 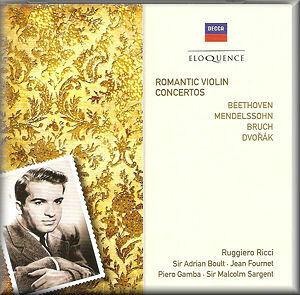 The two Hindemith sonatas that follow reveal Ricci at his best. The dance patterns and motifs are strongly etched, control is nimble and acute, there is sufficient warmth of tone and finger dexterity is perfectly adequate to deal with the fiendish locutions of the Prestissimo finale of the Op.31 No.1, as much as the pizzicato placements of the third movement of the companion sonata. Similarly his Prokofiev solo sonata parades his affinity with the vernacular. In the brief notes he tells of just beating Szigeti to the American premiere. His playing here is lithe, occasionally febrile – but in a just cause – and wholly convincing in its own way. 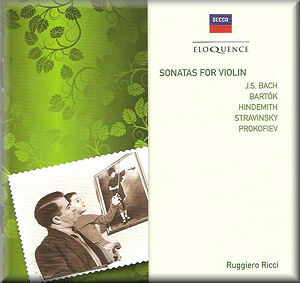 The Op.94a sonata for violin and piano – the one originally for flute - was recorded in Ricci’s own house in New Jersey, though Decca claimed it was in their habitual West Hampstead studios. Actually the sound is not brilliant, despite the violinist’s claim, but the performance is. It ends six well filled discs, availably in twos. Gaps have been plugged very nicely and Ricci’s many admirers will want to investigate this temptingly priced selection of his Decca outings.